Infused with LOVE, this gentle and light weight lotion is super hydrating. Only the finest natural ingredients and essential oils are used to create a healthy radiance to the skin. Hibiscus- refines skin, tones, firms, controls oil, creates a glow, helps retain hydration and smooth lines. 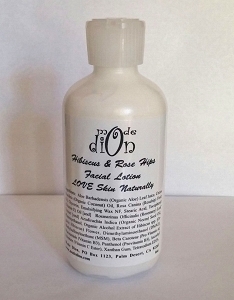 Reduces discoloration, pore size, redness and acne. Rose Hips- Regenerates cells, heals scars and acne, hydrates, smooths lines, provides de-aging anti-oxidants. Creates a beautiful glow.